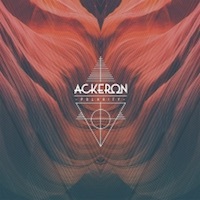 How about checking out this debuting French band called Ackeron today? Sure, lets do that and have a look at the album called Polarity. The first I can say about it is that the artwork isn’t the most impressive I have ever seen, it doesn’t really evoke any desire to check it out. But I have of course checked out the seven tracks offered on this release anyway and have come to some conclusions that I have written down in this review. Musically they are compared with the likes of Gojira, Architects, Textures and Soilwork and if you know these bands I guess that description is pretty good. It is modern metal with lots of groove and energy, mainly screamed vocals of the kind you can hear from many metalcore bands and also the likes of Gojira. These screamed/grunted vocals are mixed somewhat with clean vocals even though the feeling is that the unclean voice is the dominant on this album. The first track promises much variation containing much of interest while the following tracks are less varied and it almost feels as though they blend together a bit. But it is kept short and sweet, and with the good production to add into that equation, I would conclude that the playing time is relatively sensible. Hard to claim that this is anything other than good, as it is really well made and it has a nice groove to it – I would claim that it is quite difficult to dislike an album like this. That doesn’t mean that it is fantastic though, the vocals are actually quite poor and the album looses something when the first track ends, that track is fresh and fascinating while the rest of the album feels quite predictable and lack surprises. The band shows a bit more promise than the end result delivers but if you like the bands counted as similar it is a good bet that you will enjoy this album. As much as I like this album, I can’t help but feel that it could have been more. The first track shows promise that the rest of the album fails to deliver. And in the end I find this to be one of those good albums that doesn’t make a very big impact on me, I can’t dislike it as it is too good for that, but I can be impressed either as it lacks too much for that. The ending of this review will therefore claim that I find this to be a good album, fans of the genre will most likely enjoy it quite a bit, the French band has certainly delivered a strong debut.